Our next point of interest was Gunung Mulu National Park. Arriving in the afternoon, we were transported to Benarat Lodge where we would spend a few nights as a base to explore the park before travelling the head-hunter’s trail to Limbang. After being assured that the river flowing past our accommodation was free from crocodiles (phew!) and false gharials (damn! ), we plunged into the cool water for a swim. As we floated in the current, keeping an eye out for the longboats that travelled the river, we could hear a repetitive barking call from the limestone cliff that overhung the water. We spent some time searching with binoculars for the source (monkeys? birds?) to no avail, and were later told that it’s a huge gecko. Guides would often tell us a story about this species (which we later found to be the Green-eyed Gecko, Gekko smithii): that a large individual would be worth many thousands of dollars on the black market for the ‘medicinal’ (think men’s problems again) properties of the gall bladder, and that poaching was not unknown. 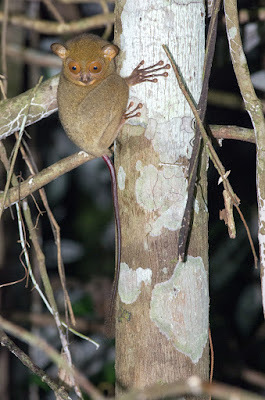 And a Tarsier it was indeed - the Western Tarsier to be specific. We’d already been grilling guides and rangers about where and how to see them, but had heard only disappointing reports of their scarcity and the difficulty of spotting them. One persistent story which crops up repeatedly, even in books, is that these animals do not give off any eyeshine. We can say unequivocally that this is false. Perhaps their eyeshine is more like that of a frog or a reptile compared with that of a cat or a civet, and perhaps you won’t see it unless you’re wearing a headtorch, but to us it was plainly obvious. 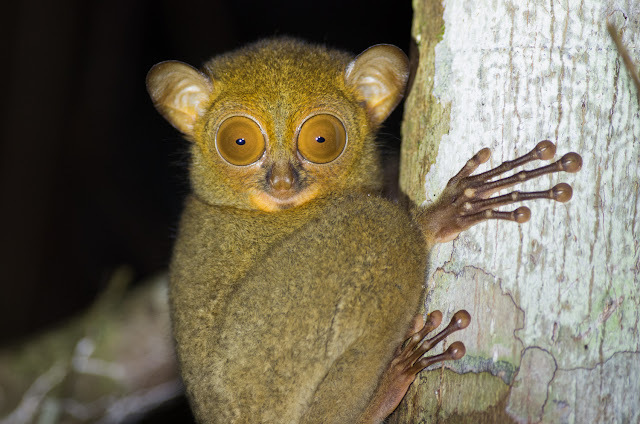 During our period of celebration and marvelling, the Tarsier sat there patiently, gripping the tree with its long, padded, frog-like fingers and toes, gazing at us with improbably large eyes as we studied it. The back legs fold up next to the body – also reminiscent of a frog. The long slender tail ends in a bottle-brush like tuft; the ears are large and delicate. After some time it turned away from us and sprung away on to another tree. It was almost enough of a sighting to justify getting out of the rain and heading back to base, but now our blood was up and we set off once again in the direction of the park. Again, it wasn't long before George spotted eyeshine – this time some distance away in a mango tree close to a house in a rural area. We trained binoculars on the eyes and could just make out a primate-shaped creature climbing deliberately amongst the branches. We both had the same thought: could it be a Slow Loris? Ignoring the dogs barking from the direction of the house, we approached the tree. We peered up through the foliage and saw a round face with sad-looking eyes gazing down at us. 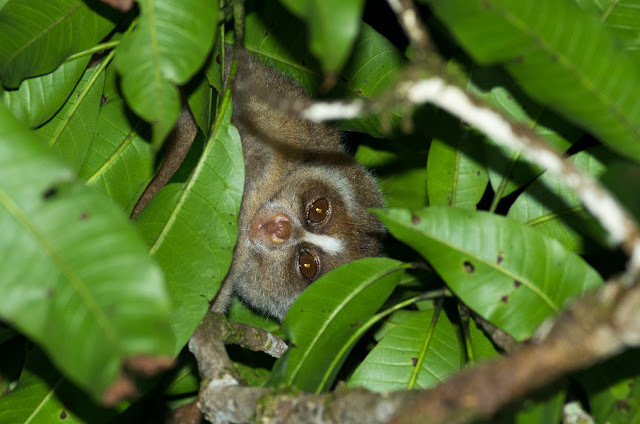 Minutes after spotting our Tarsier, we had made another rare sighting; a Sunda Slow Loris. These animals are possibly best known for the Youtube videos that show them as pets doing amusing and very cute things like getting tickled with apparent pleasure, eating rice balls and holding tiny umbrellas. However, there’s a dark side to the pet trade of these creatures – they are often collected illegally from the wild, have their teeth removed, then suffer from a variety of maladies while in captivity. If you’re wondering why the teeth are removed – it’s because the animal secretes a certain allergen from glands on its arms, which it then licks and incorporates into its saliva. When it bites, it tends to hold on, to allow the saliva to flow into the wound. This then may cause anaphylaxis in the subject, and subsequently, even death. Baby Slow Loris are also licked by the parent and thus coated with the allergen. 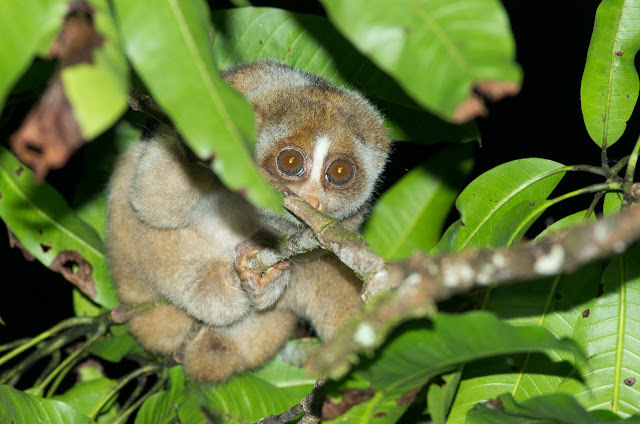 Slow Loris, like Tarsiers, are primates – considered a primitive group compared with the monkeys and apes. In the mammal book that George was good enough to lug around for our reference, there was a page with four illustrations – the Colugo, Pangolin, Tarsier and Slow Loris. A sort of mixed bag of the rare, oddball, incredible mammals that occur on the island of Borneo. In Australia, studying the book before leaving we’d only fantasised that we might see some of them, but as our first night at Mulu came to an end, without even reaching the park, we’d already had thrilling encounters with all four. Fantastic. I didn't realise how easy it was to see these animals. A tarsier and a slow loris. You lucky, lucky thing.